I am lucky to be old enough, and to have arrived in London just in time, to have enjoyed the considerable pleasures of the old Reading Room at the British Museum. The circular space at the centre of the Great Court, which attained almost sacred status to the Capital’s writers of yesteryear, was just about the most evocative place one could imagine to read or write. The Victorian desks, low glowing lights, the curved bookshelves lining the perimeter walls and the elegant clerestory windows were all suitably impressive but so was the archaic ticketed entry system which made you feel as much a part of the ancient furniture as the often impenetrable tomes in the room. Pushing open the low gate and entering the hushed arena of that literary sanctum was about as good as it got for me back then and I mourned the closing of the old Reading Room in 1997 like the loss of an old friend. It remains my favourite London space, despite not being open for 17 years. Not wishing to replace such a special relationship, I never visited it’s replacement at the red-brick British Library but of course, like other old friends now lost from sight, thoughts of the Reading Room had faded from my memory with the passage of time. Until a book arrived through my door yesterday that re-awakened them. 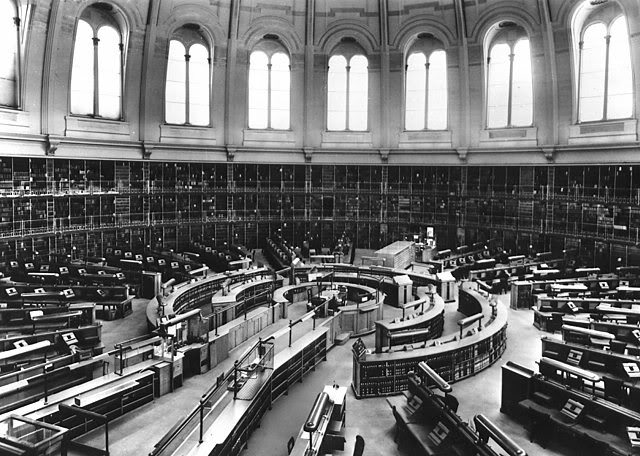 The British Museum Reading Room pictured at some time before it’s closure in 1997. 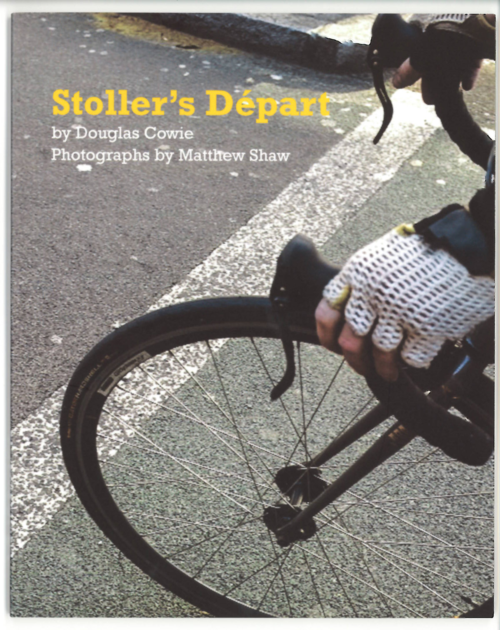 Stoller’s Départ (British Library Publications) is a slim offering, commissioned by the Yorkshire Grand Départ, which presents the documentation of two similar journeys – a writer’s and a photographer’s – as they take a circuitous route between the old Reading Room at the Musuem and the new one at the Library. Douglas Cowie’s text is the kind of airy, detached writing that lets you see the city you live in and are familiar with anew and makes you yearn for its quiet and forgotten spaces. The photographs are by Matthew Shaw – who took the excellent portrait of me on the recent Tweed Run – and cleverly ground the prose back to the realities of urban cycling. Part of the commission is for the authors to deliver the official record copy of the book to the British Library’s document storage site. And this is where Yorkshire and the Tour de France come in. Unlike like the fictional Stoller’s (from the 1979 cycling film Breaking Away) short journey within a few short London streets, the 200 mile ride to the Library’s sister site in Boston Spa near Wetherby will take a full two days. Cowie and Shaw will do the ride to coincide with the Grand Départ next week. Douglas is a Reader (a user of the Library) but Shaw works there in the North American Studies department and they will be joined by around 18 other members of staff looking to promote the “One British Library” initiative, which is trying to foster better links and understanding of the two sites. If, like me, you have any sort of love of Bikes & Books, then this dreamy little paperback might be worth seeking as a souvenir of the 2014 Tour and also as a momento mori of the magnificence of the Museum Reading Room. Stoller’s Départ is available for £5 at the British Library Shop. This entry was posted in Le Tour de France, Product Reviews and tagged Boston Spa, British Library, British Museum, Cycling, douglas cowie, grand depart, Grand Tour, matthew shaw, reading room, stoller, Tour de France, yorkshire. Bookmark the permalink.